A little change can make a big impact in a home. Just ask Anne Marie Fuller. She’s the popular blogger with Growing Up Madison who tracks lifestyle and home trends, reviews products and reports on the growth of her family. For Anne Marie, her small change was replacing an old worn out toilet with a Summit 1.28 Gpf toilet. She chose a SmartHeight toilet with elongated front and a slow-close toilet seat (to prevent her four-year old daughter Madison from slamming the seat down). Anne Marie was able to make a big impact on her home’s water bills by selecting a 1.28 Gpf toilet. Her older toilet used about 5 gallons with each flush, and with five people in the family, that was adding up to money headed down the drain. 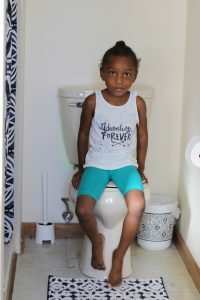 Read about Anne Marie’s replacement toilet project and other household water saving tips by clicking HERE to see the Growing Up Madison blog.